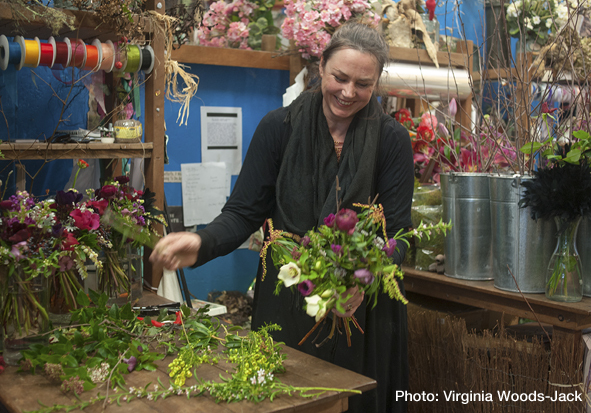 One of Wellington’s favourite florist’s Flowers Manuela has been creating a beautiful touch of nature for us at meaningful moments for 16 years this week. So in this interview we talk to owner, the lovely Manuela, about growing up on a flower farm, the challenges that face our local flower growers and what she loves about her 16 years of being on Cuba St.
P.S. Flowers Manuela was also voted Wellington’s Best Florist by Capital Magazine ( well when they were the newspaper) Readers for 7 or 8 years in a row, this just shows what a wonderful crew of super florists they are. This entry was posted in Enterprise and tagged Cuba St., Sustainability by lauriestarfish. Bookmark the permalink.